The completion of Std VI at Crooked Tree Village was full of excitement. Announcements were sent out by teachers and families to extended family members and friends announcing the "Graduation" with an elaborate party to follow. Yes, this all happened in Crooked Tree Village last Thursday, June 28, 2012. 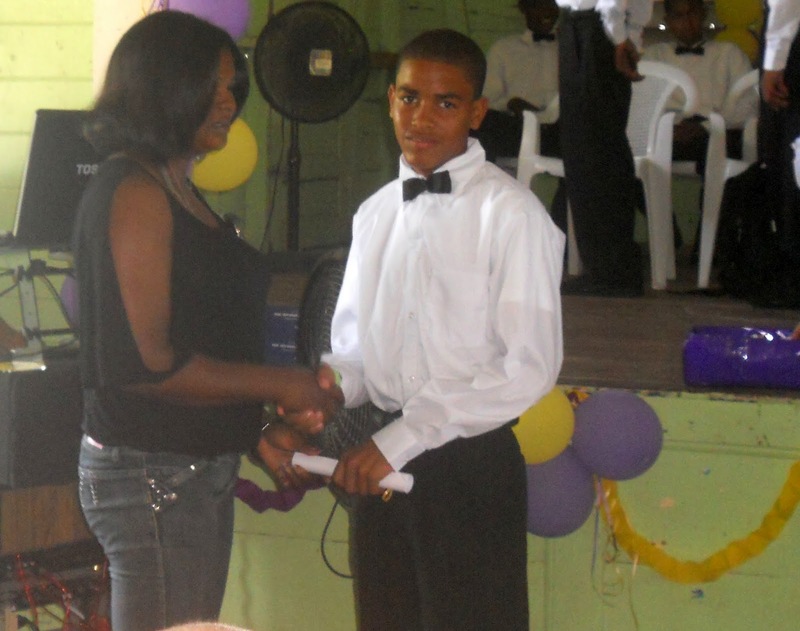 During this graduation season, Crooked Tree School graduated 20 students and all achieved competitive and outstanding Primary School Examination (PSE) marks that will enable them to move on to high school. And talk about competition; two students were neck and neck this year as valedictorian; Arturo Wade and Shawn Crawford received the highest honors as students of the year. Principal Winnie Gillett addresses the graduates by impressing upon them the importance of graduation. She told them that graduation is a chance to say goodbye, to reflect on past accomplishments, and encourage them to look forward to the next phase in life. “I think it is important for these kids to be recognized and be celebrated for who they are, and where they are in life’s journey. I also firmly believe that having the collective chance to pause and reflect is truly important. I also want to send a message to the parents of these students that this is not the end, only a station on the road. Without you, parents, the chance of a high school diploma is not possible; you do and will make a difference in the lives of these outstanding children." Guest speaker, Mr. John Gillett IV encouraged all the students to set a goal. “You must have a goal or goals that you are seeking to achieve both educationally and personally”. He encouraged all students to graduate from high school and prepared for college or advanced career training. All students were invited to the podium by Annamarie Gillett, where they were presented with their diplomas and special awards and scholarships. Mr. John Gillett III, General Manager of the Belize Sugar Industries presented three four-year scholarships to Arturo Wade, Alethea Garbutt and Rhavin Gillett. 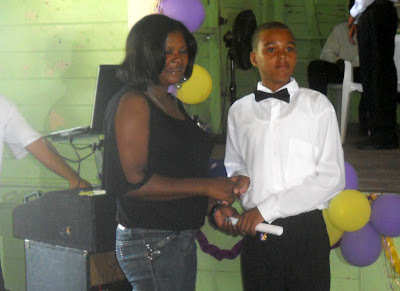 Shawn Crawford received a four-year scholarship from Ms. Adela Pederson, President of the Consortium for Belizean Development, Ins. in San Diego, California, USA. Alex Aragon received a scholarship from Ms Hilda Flowers, and Shane Crawford from Mr. Lloyd Allen. Congratulations to the graduates, teachers and parents of Crooked Tree Village! A pleasant good morning to all! Before I commence I would like to pay special acknowledgement to those in attendance namely: School Principal Mrs. Winnie Gillett and her fellow staff members, Belize Rural North Area Rep. Hon Edmund Castro, Local Manager for Government Schools Mr. Lopez, General Manager for Government Schools Rev. Anthony, village chairman George Guest, other special invited guests, parents, guardians, fellow villagers and most importantly the 20 students of Crooked Tree’s Government School 2012 graduating class. I must say today that I am deeply honored and humbled in being asked to be the guest speaker for this special occasion. It was a surprise when I received the telephone call asking me to be this year’s guest speaker, and it was an even greater surprise to me the 2 seconds it took to answer YES. For those who may not know me well, my roots lie very deep in the Village of Crooked Tree. Both my parents, Chriselda Westby Gillett and John Gillett II were born and raised in Crooked Tree and both attended this very school, decades ago. I am grateful for the heritage I have gained through my parents who are indeed fruits of this village, as I have found myself spending much of my life in Crooked Tree, learning many important values from the village elders and my fellow relatives and friends. This was my foundation in life and complemented by my own ambition, has contributed to me being the individual I am today at age 28. Today, I know this audience expects a lengthy, well worded, inspirational speech, and I will try my best to match these expectations, but most importantly I wish to lend a helpful hand and provide relevant words of advice to our graduates, with myself clearly remembering being in their shoes some 16 years ago. Well graduates, here we are today celebrating your great accomplishment and more so the great foundation your family, friends and school have assisted you to build. A primary school education in the work environment is not highly regarded when seeking employment, but I believe it is the greatest building block in life for any individual. Today, our 20 graduates have experienced a primary school education through Crooked Tree Government School, and I am certain the management and staff have done a fine job in ensuring our graduates are able to step into any secondary level institution in Belize and perform at the highest level. 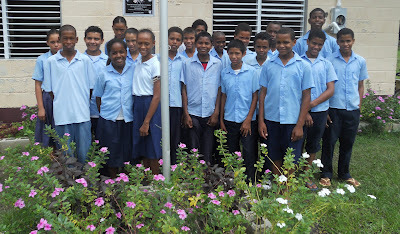 I cannot continue without highlighting the impressive level of performance the students and staff of Crooked Tree Government School put forth in the 2012 PSE, we placed 7th in the Belize District, and 14th country wide. I must say that whatever is being done to get this level of performance, let’s keep this formula going. You have all done well, and are now prepared to enter a new chapter of your life from both a personal and educational standpoint. With dedication and hard work, you are geared for success. However, this might be easier said than done boys and girls; as individuals there are several things you must do on your part to ensure success in future educational experiences and more so in your life moving forward. First of all graduates, you must have a goal or goals that you are seeking to achieve both educationally, and personally. I know you all had a goal to complete your primary school education or as easier said ‘pass standard 6’. I know you are all young, but it is never too early to know what you want in life and to start setting goals for yourself. To do well in life, you have to know what you want to achieve. You will realize that as you continue to mature; planning becomes more essential as the demands on your life increase. I hope that by this time, you have already set a goal as to the high school you will be attending and also set a goal as to which level of education you wish to achieve in the years to come. I will say graduates, don’t be afraid of being ambitious, nothing is too big for you, it is all achievable. You may be afraid or shy to say at this time to your family and friends, ‘I want to obtain a Master’s or Doctorate Degree’ because we all know this takes many years, endless effort and even more the finances involved in achieving these goals are substantial. However, I guarantee you that once a goal is set in your mind; you have automatically given yourself a great chance of achieving that goal. Graduates, put in your minds today, you can and will achieve that goal which is now set in your mind. Growing up as a young man, I had an educational goal, that goal was to obtain a Master’sDegree. Now, I never knew how many years it would take me, how many hours of study I would have to put in, or how much money it would require; but I moved ahead in life taking things one step at time, never going ahead of myself. Apart from all these factors contributing to the achievement my goal, most important was the strong support received from my great family and the very good friends in my life. Today I task the parents, guardians and immediate family members of our graduates to lend them the moral support needed. Financial support is crucial, but will only do so much for you; the inspirational words and advice you receive each day will go even further. Again I talk from experience, and I will say I was fortunate to have parents who kept me in line when I strayed from my goal and also motivated me when I was down. Now, outside of your family at home, you have and will meet many people in life, some of whom you create close friendships with. Friends are a great complement to any of our lives, I beg however be careful of the friends you choose. Friends have the ability to build you up or bring you down, in the end ensure the people close to you in your life are those who bring optimism to you and support the achievement of your goals. A second point of importance I want to highlight leads off my last statement and spells the importance of maintaining a positive mentality in life. Before I have hinted on the value of having support from family and friends, but all that support cannot materialize if you do not maintain a positive attitude. As you move into your next level of education, you will meet school work that challenges you, teachers that pressure you, and fellow school mates with different personalities you may find difficult to understand. Well, these are indeed realities of life that you cannot allow to bother you and create any form of negativity within you. Again I come back to the fact that no matter what challenge you meet, you must remain focused on achieving your goal. Do not allow issues that are outside of your control to bother you, you need to control what is within your power and don’t take life too personally. A concept I apply to my own life is that everything that happens, whether positive or negative, happens for a good reason. Here is where a positive mentality comes into play allowing you to firstly understand why things happen and not relenting and beating down on yourself for things that have already occurred. Recall, we cannot change the past, but we can create a path for and dictate our future. It is obvious that no human being is perfect; we do make mistakes and fail at certain things in life, in the end we must continuously learn from these mistakes and failures in order to improve. Only through experience can you continue to further develop yourself, and the experience to be gained over the next 4 years of your life will only make you stronger. I encourage you to be open to experiencing all that life has to offer, you are young and will grow to be productive citizens of this village and country; and I cannot reiterate enough how all this will be done. It can only be done with each of you maintaining a positive attitude towards life. As you have now experienced what I would called the first phase in your educational path, this leads me to discuss as my third major and final point, which is the value and importance of an education. I am especially proud to see 20 strong graduates from the successful program Crooked Tree Government School has put in place and to that yes, we have 20 more members of our village walking down the right path in life. I speak highly of education, as I have myself during my school days realized through both good and bad experiences, how valuable an education is. To give you a short story, when I attended high school in Orange Walk, I started off as a good student with good grades. First form went well, second form started well; but as I progressed throughout the year I began falling for some of the temptations of youth and slacking off my studies; forgetting that what I put in my studies, being nothing, is what I would eventually get out of it. I fell out of love with my education and fell in love with basketball; I actually believed I could make the NBA by practicing hard enough, a good goal, just not one for me. Eventually, I neglected my education so much that when I received my end year results, I grew pale and started a cold sweat realizing I had failed a grade for the first time in my life. Essentially, I lost focus on achieving a goal I had set when I entered high school, but I learnt a hard lesson and from that day forward right through to the time I achieved my Master’s Degree, no one has ever had to tell me to hit the books and study again. While I did fail during the course of achieving my high school diploma, which took me 5 instead of 4 years, I have never regretted failing and know that it was indeed the most important learning lesson and more so a positive turning point in my life. importance of an education, realize the effort you will be putting in everyday as you travel to and from school, realize the amount of class and home study hours you will be putting in, and realize how hard your parents or guardians have to work to provide you with the necessary financial support allowing you to obtain an education and more so giving you an opportunity to succeed in life. Leave nothing to chance, graduates, what you put in your education, is what you will get out of it. You are now set to continue down the right path in life and with an opportunity to continue uplifting the Village of Crooked Tree and become productive citizens of our country. Keep your goal in front of you and stay positive every day. We know you will feel obligated to make teachers, friends and family proud as you enter high school; however at the end of the day I want you to move ahead in life impressing yourself and making yourself proud. Today I hope I have helped you in opening your minds in some way or form and I wish you all the success in life. With your great minds, you will grow to achieve great things and become even greater adults. From me to you; a huge congratulation on your achievement! It was very interesting to see how far our village and Crooked Tree Government School (CTGS) has progressed forward over the years. During the time when my brothers, sisters and I attended CTGS, graduation was never on the cards for the poor families who at that time occupied the village. All that one was proud to receive was a Primary School Certificate! John Alexander Gillett, my brother and the Manager of Belize Sugar Industries, is therefore John Gillett III. Hence, John (Jun Jun) Gillett, the speechmaker and my nephew, is therefore John Gillett IV. My congratulations and very best wishes for continuing successful future achievements of all the graduates concerned.